Facilities: FDC Oakdale with an adjacent minimum security satellite prison camp. 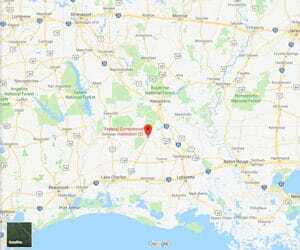 Location: FDC Oakdale is located in central Louisiana, 35 miles south of Alexandria, 58 miles north of Lake Charles, off State Highway 165 on Whatley Road. Background: FDC Oakdale opened in 1990. It is part of the Oakdale Federal Correctional Complex (FCC). Health Services: Health care at FDC Oakdale includes medical, dental, and mental health services, emergency medical and dental care, medications, periodic health examinations, and eyeglasses. Inmates new to the institution with contact lenses will be evaluated for medical necessity of contact lenses. If contact lenses are not medically indicated, the inmate will be provided with eyeglasses. Emergency care is available 24 hours a day. Inmates must submit a sick call form in order to be evaluated for routine care. Psychology Services: Services provided by the Psychology Department include crisis intervention (suicidal risk assessments), psychotherapy (individual and group), psychological assessments, and psycho-education (self-help and audio/visual material). All inmates/detainees must complete, sign, and date a Psychology Services Inmate Questionnaire (PSIQ), provided by medical staff, on their arrival at Receiving & Discharge (R&D). This is a mandatory assessment. Inmates/Detainees in the Special Housing Unit must receive mandatory 30 day reviews by Psychology Services. Assessment using psychological testing will be completed as determined by the psychologist. Additionally, the staff psychologist conducts the following programs: 40-hour Drug Education Program, Stress Management Group, Psychological-Educational Support Group, and Anger Management Group. Each of these groups meet weekly. Residential Drug Abuse Program (RDAP): FDC Oakdale does not house a Residential Drug Abuse Program (RDAP), however does offer the Drug Abuse Education Class, and the Non-Residential Drug Abuse Program (NR-DAP). Education Services: FDC Oakdale provides literacy, GED, and English-as-a-Second Language (ESL) programs. A parenting program and Adult Continuing Education (ACE) courses taught by fellow prisoners, are also available. A self-paced ACE program offers inmates the opportunity to utilize handouts and a textbook to complete classes independently. High school diplomas and post-secondary programs are available through paid correspondence programs. Advanced Occupational Education: FDC Oakdale does not offer any advanced occupational education programs. Vocational Training: FDC Oakdale does not offer any vocational training programs. Apprenticeship: The satellite camp offers an apprenticeship program in Welding. Library Services: FDC Oakdale provides access to a legal library, where legal materials are available via the TRULINCS Electronic Law Library. A leisure library is also available which provides a variety of fiction and nonfiction books, newspapers, reference materials, and periodicals to the inmate population. Titles unavailable in the library may be obtained through the interlibrary loan program. Typewriters and a copy machine are available to inmates. Inmates are given 25 free legal copies per month and each additional legal copy costs five cents. UNICOR: FDC Oakdale does not house a UNICOR facility. Commissary: Inmates are allowed to spend up to $360.00 per month at the commissary. Shopping is permitted once each week. The shopping day is determined by the fourth and fifth digits of the inmate’s BOP register number. Inmate must have their account card in their possession in order to shop at the commissary. Items such as food, sodas, snacks, ice cream, clothing, and electronics are available for purchase. Recreation Services: The FDC Oakdale recreation services include both indoor and outdoor activities. The gymnasium area comprises the recreation supervisor’s office and the basketball court area. The recreation yard includes a hobbycraft area. This area houses the tool room for the hobbycraft activities, an art room, and a classroom. Activities include leather craft, basket weaving, woodwork, yarn art, stick craft, free-lance painting, and drawing. Indoor activities also include dominoes, chess, card games, checkers, Yahtzee, backgammon, and Scrabble. The recreation yard has a running track, soccer and football fields, bocce ball lanes, horseshoe pits, four handball/racquetball courts, tennis/basketball court, softball field, and two volleyball courts. Court games such as handball, racquetball, tennis, horseshoes, basketball, bocce ball, and pickleball are also available. The intramural sports program includes basketball, volleyball, soccer, flag football, and softball. Organized fitness programs include run/walk clubs, fitness clubs, and a Wellness Program. Music related activities and programs are also available for inmate participation. Instruction is available in guitar and various percussion instruments.